One of the best ways to keep ants out of hummingbird feeders is to use an ant moat, guard or trap. You can either get a hummingbird feeder with a built-in ant moat, attach a guard or moat to your existing feeder or make your own. 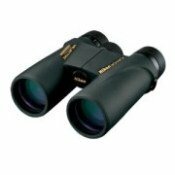 We review these options below since ants are a common problem at feeders among other pests such as bees and wasps. 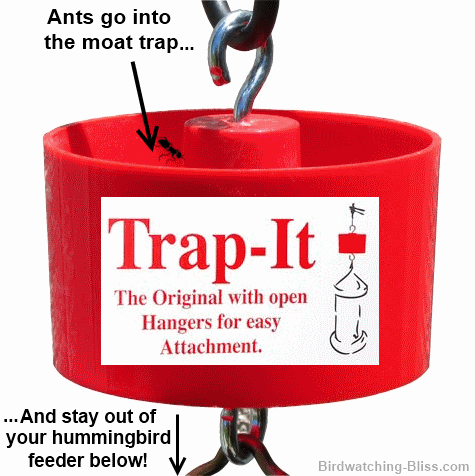 If you do not have a hummingbird feeder with an ant moat already built-in like the Ultra Hummzinger , then you can add one by attaching it between the feeder and the hanger rod like the ant trap below. You simply fill the moat with water and ants go in, but they can't get out - and more importantly, they cannot get to your hummingbird feeder. Most found the Trap-It to be the best out of all the different types of ant traps you can get because it is easy to use and clean. Make sure you keep the moat clean of debris and empty the dead ants out often if you have lots of ants or else a "bridge" will be formed that the ants can use to cross over the water to your feeder. Here are the cup hooks that are mentioned in the video for attachment. You will then screw one into the cork bottom where it will attach to the hummingbird feeder. 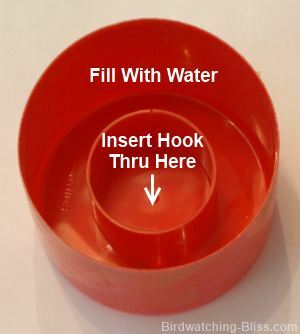 The other hook will screw through the cap (see below about using a different type of cap), which acts as your ant moat, and into the other end of the cork. Then attach to your hanger rod and fill the moat with water. 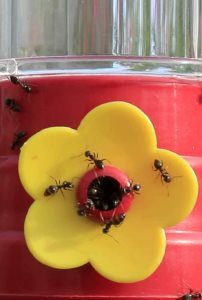 The video below demonstrates another version of a homemade ant moat using j-bolts, washers, coupling nut and a plastic spray-paint can top which has two "compartments" to help prevent leaking at the attachment points. You can probably find similar caps on top of other aeresol-type products like cooking spray or hairspray. 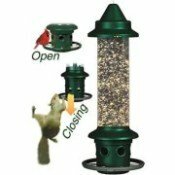 This design is a little sturdier then the one is the above video and will hold more weight if you have a larger hummingbird feeder. If you find the cap leaks through the hole, you can always seal it off with some glue, silicone sealant or even candle wax. See the next design below the video on using "O" rings as an alternative for sealing. Here is one more design using a tin can for the moat attached with two threaded hooks through a turnbuckle. 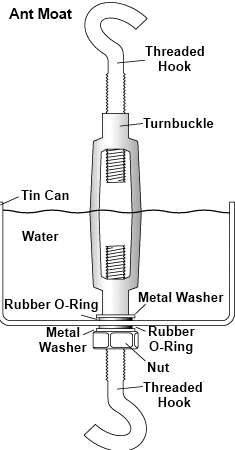 Metal washers, a nut and rubber "O" rings are used through the can to make it water-tight without having to use glue or other sealants. This design is courtesy of the University of Kentucky, College of Agriculture Cooperative Extension Service. Without an ant moat or trap, some have tried applying Petroleum Jelly (Vaseline), grease and oil to the hanger rod which can prevent ants from traveling to the feeder. However, most people do not like having to reapply it, it's messy and it is not good for the birds if they get it on their feathers. 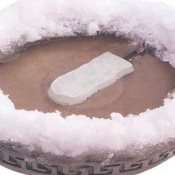 When it gets hot, these substances tend to melt and ooze down toward the feeder and make a mess. Do not use duct tape or other adhesive material, like Tanglefoot, because it too can cause problems for birds if they come in contact with it. If you live in an extremely arid area with low humidity, you may find a traditional ant moat may not be as effective because the water evaporates too quickly. The moat dries up before you can refill it, is no longer moat-worthy and the ants simply climb around it to your hummingbird feeder. 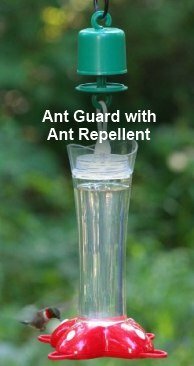 Instead of using a water moat, you can attach an ant guard that contains an ant repellent to keep them off your feeder. The Perky-Pet Ant Guard contains permethrin, an insecticide commonly used to treat scabies, for mosquito control and found in products for pets and to spray on clothing to repel insects. It is safe for use around birds as well. Note: Although it is generally safe for use around humans, most other mammals and birds, it is extremely toxic to cats and fish. So make sure your cats don't get a hold of the guard and as a precaution, I wouldn't hang it over your fish pond. Giant Ants, Tiny Ants Too Many Ants; Ant, Ants Everywhere! If you still have ant problems because you have so many ants, i.e., the moat fills up too quickly with ant bodies and a bridge if formed, then you may have to take further steps as outlined below. Ants are attracted to the sweet nectar, especially if your feeder is leaking. Leaking is often caused by the nectar heating up in the sun during the hot part of the day. To eliminate this problem, move your feeder to a shady spot or attach an "umbrella" to shade the feeder. A square piece of cardboard would be better than nothing. "You're Gonna Need a Bigger Moat"
You could try using a larger moat if you have a big (big ants and/or lots of them) ant problem. I read where someone used a plastic bundt cake pan attached to the shepherd's hook as their ant moat - now that's a serious moat! Lastly, sometimes it just takes moving the feeder to a different location to solve your ant problem. You may not even have to move it far. Just try a different spot and you may be pleasantly surprised with fewer, or even (cross-your-fingers) no ants!